As flutist Lorna McGhee sang hauntingly into her instrument and cellist Clive Greensmith slid fingers eerily up and down his, Roman Rabinovich sealed the deal, evoking chirpy whale song and the murky sounds of the deep with electronic effects on a grand piano. When the Montrose Trio played the passage Saturday night at the Shalin Liu Performance Center as part of the Rockport Chamber Music Festival, it resounded with both reverence and vigor. From a simple start at the keyboard, the strings make a lovely entrance. Mr. Barnatan's playing draws commentary from the violin and cello; and Mr. Greensmith's turns of phrase have a lovely polish. Mr. Barnatan rippling motifs, with plucking strings, lead onto a pensive theme passed from cello to violin and back. Following an animated variation, the movement ends calmly. Their performance was the most satisfying of the concert, with the musicians bringing great intimacy to the piece’s more introverted moments. 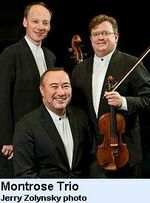 The University of Chicago Presents’ Mandel Hall season came to a close in fine fashion Friday night with a stellar performance by the Montrose Trio in their Chicago debut. As the applause for this evening's opening Suk quartet commenced, my companion and I turned to one another and said, "The cellist!" We'll be looking for any opportunity to hear him again. In the latest Rennolds Chamber Concerts program at VCU’s Singleton Arts Center, the Montrose Trio gave one of the finest chamber-music performances in recent Richmond seasons in a delectable if debatable interpretation of an early masterpiece by Brahms. "The Turina was a fine introduction to the sterling qualities of the performers. 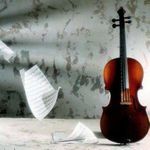 Violinist Beaver displayed a remarkably beautiful tone and a finely tuned sense of phrasing, while cellist Greensmith revealed an almost vocal quality to his playing, which brought an extra measure of interest to an instrument that can often be subsumed in a trio setting." "The totally integrated principals – Ani Kavafian and Nicolas Dautricourt, violins; Paul Neubauer, viola; Clive Greensmith, cello; and Michael Brown, piano – collaborated in refined harmony..."
The Montrose Trio did it proud, supplying every ounce of artistry in delivering an impressive performance that would have made the master happy. ...Tchaikovsky gave the piano greater prominence in the opening movement, in which Montrose pianist Jon Kimura Parker reveled with unalloyed ardor and consummate artistry. Fortunately, the Piano Trio’s lengthy other movement, constructed on a theme with eleven variations, gave ample opportunity for violinist Martin Beaver and cellist Clive Greensmith to demonstrate their polished technique and sympathetic realization of sumptuous melody. "...in the opening “Ophelia’s Song,” a duet with Greensmith and soprano Lyubov Petrova, he made his line soar, and ache, and caress, without histrionics and with an unusual consistency of tone." "Their performance delivered absolutely top-notch music-making, as fine as one could ever expect to hear." "The overall approach to the piece is beautifully balanced, with the four playing as if they are one. Ultimately, this late-Romantic, overtly emotional music is a mighty fine way for this quartet to close its glorious 44-year history."